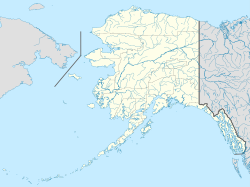 Gustavus (gus-TAY-vuhs) is a second-class city in Hoonah-Angoon Census Area in the U.S. state of Alaska. The population was 429 at the 2000 census and 442 as of the 2010 census. Gustavus, formerly known as "Strawberry Point", lies on the outwash plain created by the glaciers that once filled Glacier Bay. Two hundred years ago, it was primarily a single large "beach". The native Tlingit people and others used the area for fishing, berry picking, and other similar uses. The town itself is less than one hundred years old. The first settlers arrived in 1914, but left shortly afterward. The first permanent homestead was established in 1917, when Abraham Lincoln Parker moved his family to Strawberry Point. Many Gustavus residents are descendants and relatives of the original Parker homesteaders. In 1925 the name became "Gustavus", when the U.S. Post Office required a change for its new post office, although locals continued calling it "Strawberry Point" long afterwards. The new name came from Point Gustavus at the mouth of Glacier Bay. In 1793 George Vancouver named Point Adolphus (at the northern tip of Chichagof Island, and today a well-known humpback whale feeding area) after Adolphus Frederick, seventh son of King George III. In 1878, W.H. Dall, while working on a coastal survey, saw "Adolphus" on the map and assumed it was for Swedish king Gustavus Adolphus. The point across Icy Strait from Point Adolphus at the mouth of Glacier Bay was not named on the map, so Dall called it "Gustavus". Another possibility is that Dall named Gustavus for Gustavus C. Hanus, a U.S. Naval Academy graduate who had extensive experience throughout southeast Alaska, and both Dall and Hanus served with the Coast Survey in Alaska. Hanus laid out the first streets in Juneau and helped quell the trouble in Klukwan in 1881. There is still a large beach at Gustavus, with many strawberries. The city is surrounded on three sides by Glacier Bay National Park and Preserve, and on the fourth side by water. The area is a temperate rain forest; spruce and hemlock trees reach heights of 60 metres (200 ft), and alders, balsam poplar, fern, mosses, fireweed, lupine, and other plants are also common. Gustavus's coastal location gives it a relatively mild winter. Summer temperatures range from 11 to 17 °C (52 to 63 °F); winter temperatures from −3 to 4 °C (27 to 39 °F). Gustavus is located at 58°24′59″N 135°44′44″W﻿ / ﻿58.41639°N 135.74556°W﻿ / 58.41639; -135.74556 (58.416327, -135.745549). According to the United States Census Bureau, the city has a total area of 36.9 square miles (95.7 km2), of which 32.8 square miles (85.0 km2) are land and 4.1 square miles (10.7 km2), or 11.16%, are water. Gustavus is split by the Salmon River, a small waterway crossed by a bridge for the paved road running out to Glacier Bay National Park. Coho salmon, Dolly Varden, and other fish are commonly caught in this river. Within the city limits, the river is affected by tides. Gustavus has a wet, maritime subarctic climate (Köppen Dfc). Gustavus first appeared on the 1940 U.S. Census as "Strawberry Point", an unincorporated village. In 1950, it returned as Gustavus. It was made a census-designated place (CDP) in 1980. Its status was changed to an incorporated city in 2004. The original Gustavus dock, which has since been replaced. As of the census of 2000, there were 429 people, 199 households, and 114 families residing in the city. The population density was 11.4 per square mile (4.4/km2). There were 345 housing units at an average density of 9.2 per square mile (3.5/km2). The racial makeup of the city was 89% white, 0% black or African American, 4% Native American, 0.2% Asian, 0.2% Pacific Islander, 2% from other races, and 4% from two or more races. 1.4% of the population were Hispanic or Latino of any race. There were 199 households out of which 28% had children under the age of 18 living with them, 47% were married couples living together, 6% had a female householder with no husband present, and 43% were non-families. 38% of all households were made up of individuals and 6% had someone living alone who was 65 years of age or older. The average household size was 2.2 and the average family size was 2.9. In the city, the population was spread out with 26% under the age of 18, 3% from 18 to 24, 30% from 25 to 44, 36% from 45 to 64, and 5% who were 65 years of age or older. The median age was 40 years. For every 100 females, there were 130 males. For every 100 females age 18 and over, there were 135 males. The median income for a household in the CDP was $34,800, and the median income for a family was $51,800. Males had a median income of $41,800 versus $29,400 for females. The per capita income for the city was $21,100. 15% of the population and 10% of families were below the poverty line. 13% of those under the age of 18 and 14% of those 65 and older were living below the poverty line. The Gustavus economy is strongly linked to the surrounding natural resources; tourism and commercial fishing are mainstays. However, the importance of commercial fishing is in decline, as the Dungeness crab fishery in Glacier Bay National Park was closed in the early 2000s and the fishing for Dungeness outside of the national park has become poor. Salmon and halibut remain as the primary catch of the commercial fishing done out of Gustavus. Those not involved in tourism or seafood typically work for the government at the public school, the post office, the National Park Service, or the City of Gustavus. Gustavus is not connected to the contiguous highway system. Gustavus Airport and the Alaska Marine Highway provide access between Gustavus and the outside world. ^ a b 2015 Alaska Municipal Officials Directory. Juneau: Alaska Municipal League. 2015. p. 69. ^ a b c "Gustavus city, Alaska". Profile of General Population and Housing Characteristics: 2010 Demographic Profile Data. United States Census Bureau. Retrieved January 22, 2013. ^ "Gustavus". Division of Community and Regional Affairs, Alaska Department of Commerce, Community and Economic Development. Archived from the original on December 30, 2012. Retrieved January 24, 2013. ^ "Geographic Identifiers: 2010 Demographic Profile Data (G001): Gustavus city, Alaska". American Factfinder. U.S. Census Bureau. Retrieved April 17, 2017. ^ "GULKANA, AK (503475)". Western Regional Climate Center. Retrieved November 19, 2015. This page was last edited on 19 February 2018, at 23:52 (UTC).